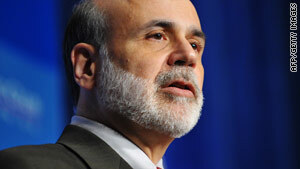 Federal Reserve Chairman Ben Bernanke was named Time's Person of the Year. The American economist and chairman of the U.S. Federal Reserve on Wednesday was named Time's Person of the Year. In August, President Obama announced that he would nominate Bernanke to a second term. "Ben approached a financial system on the verge of collapse with calm and wisdom, with bold action and out-of-the-box thinking that has helped put the brakes on our economic free fall," Obama said. CNN has confirmed through the office of Sen. Bill Nelson, D-Florida, that the U.S. government subcontractor arrested in Cuba more than a week ago is being held in a high-security prison, not a common jail. The prison indicates that Cuban officials are taking the case seriously, The Miami Herald reported. Development Alternatives Inc., based in Maryland, says it has a federal contract to support "just and democratic governance in Cuba" and described the arrested U.S. citizen as a subcontractor employed "to assist Cuban civil society organizations." The American reportedly distributed cell phones, laptops and other communications equipment to Cuban dissidents, according to the Herald. More guest list questions as the White House. Last month, Harvey and Paula Darden, a Hogansville, Georgia, couple, arrived a day early at the White House for a tour and none was available. They went through proper security screening and, as a nice gesture, were brought into an invitation-only breakfast for veterans where they shook hands with the president. The Dardens, who arrived nearly two weeks before Tareq and Michaele Salahi allegedly crashed a state dinner, are not reality-show contestants. Oprah Winfrey's production company, Harpo Productions, and Sony Pictures Television are scheduled to announce Wednesday that design expert Nate Berkus will get a syndicated daytime talk show next fall, The New York Times reported. Berkus will join the club of Winfrey launches, including Dr. Mehmet Oz, Dr. Phil McGraw and Rachael Ray. Berkus said his career in design began at a young age. "I was barely in grade school when I helped my mother rearrange the living room furniture for the first time," he says on his Web site. The 66-year-old French rock star has been brought out of a medically induced coma, according to The Daily Telegraph of London -- and millions of fans are following each step of the news that's coming from a Los Angeles hospital, where he's being treated for lingering back problems. Followers are waiting to hear if Hallyday, known as the "French Elvis," will sing again, and European journalists reportedly have been camped outside the hospital. But every day there are a number of people who become fascinating to us -- by virtue of their character, how they reached their decision, how they behaved under pressure, or because of the remarkable circumstances surrounding the event they are involved in. They arouse our curiosity. We hear about them and want to know more. What they have done or said stimulates conversations across the country. At times, there is even a mystery about them. What they have done may be unique, heroic, cowardly or ghastly, but they capture our imaginations. We want to know what makes them tick, why they believe what they do and why they did what they did. They intrigue us.